I’m not too proud to admit it – I’ve dug through plenty of junk drawers, rooted around in old tool boxes and moldering cardboard boxes, poked my nose into splintering wooden crates and such, looking for treasure amid the trash. Maybe you’ve done this, too. No need for a show of hands, it’s OK, you know who you are. Besides, you’re among friends – we understand. 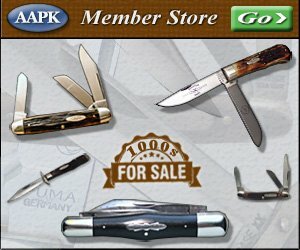 Perhaps, during one of your ‘digs,’ you came across an odd looking knife blade with an unusual yet inexplicable hooked tang – but since it had no handle, you rejected it, categorizing it as ‘curious but worthless.’ Maybe you puzzled over an empty jack knife or pen knife handle – ah, nice handle but with no blades inside, you called that one ‘interesting but useless.’ Oh, really? It could be that you were holding in your hands fascinating, if not valuable, pieces of pocket knife history. You may have unknowingly discarded blades or handles manufactured by the Nagle ReBlade Knife Company of Poughkeepsie, New York – circa 1914-1916. If you were lucky enough to have held onto these items, here’s an explanation of what a rare find you made. 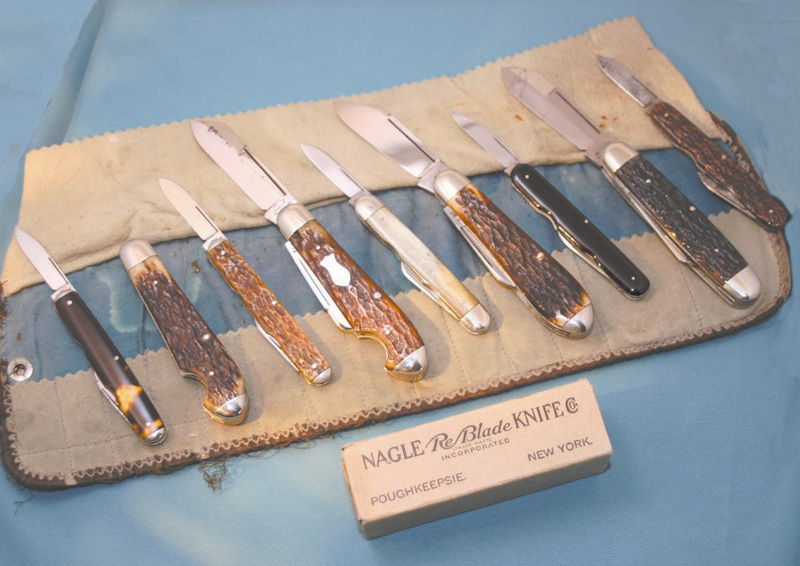 Nagle ReBlade knives were of innovative design, so much so that the company was granted three U.S. patents for knife design elements and a fourth patent for a unique manufacturing process. (Just enter ‘Nagle’ into Google’s patent search tool [www.google.com/patents] and you can easily access these and many, many other patent drawings and documents.) The concept was simple yet elegant – a handle with replaceable blades or tools. Customers could customize their knives to suit themselves. The company sold dozens of different types of blades and tools that could be selected and inserted into the handle of the customer’s choice. Handles accept either two or four blades, depending on style and owner preference. True to their word, blade replacement is a matter of opening the knife slightly and banging the end of the handle with one’s hand. The blade is thus dislodged and a new blade or tool can be easily inserted and snapped into place by applying pressure with an ordinary key. One of the company’s logos depicts an array of tools and blades that were available for purchase. Salesmen were equipped with leather-backed kits, velvet-lined rolls, with individual pockets for up to 42 separate blades or tools. Given the wide variety of options offered to customers, possibilities for personalizing one’s Nagle were almost endless. From keys and buttonhooks to saw blades, punches and files, the Nagle ReBlade could potentially do it all. If a customer wanted only one blade (or could only afford one at the time), a so-called “compensator” was inserted in the handle to “compensate” for the absent blade or blades. The compensator, an L-shaped piece of metal of appropriate thickness, provided support to the structure of the handle to prevent it from collapsing. The knife handles were available in both pen knife and jack knife sizes and were made of bakelite, synthetic horn, bone, pearl, and celluloid. According to the company’s retail price list, handles cost between $1.50 for a pearl handled, tip bolstered two bladed knife down to $0.25 for a german silver handled two blade, while blades and tools cost a quarter each. At the time, you could own a top of the line, pearl-handled, full-bolstered, four-bladed Nagle ReBlade knife for three dollars, or for a mere dollar, you could pick up a tortoise (celluloid) handled, tip bolstered, two-bladed knife. In today’s market, IF you could even find such rarities, these same knives might go, depending on condition of course, anywhere from a few hundred on into the thousands of dollars. Here is a brief history of the company, excepted and condensed from Robin S. Walsh’s chapter Disposable Blades: Poughkeepsie Style in the Dutchess County Historical Society Year Book, 1985. The Nagle ReBlade Knife Company was incorporated May 17, 1912, to take over the defunct Piogren Sales Company in Newark, New Jersey. The Piogren company manufactured straight razors and an early version of the ReBlade knife. 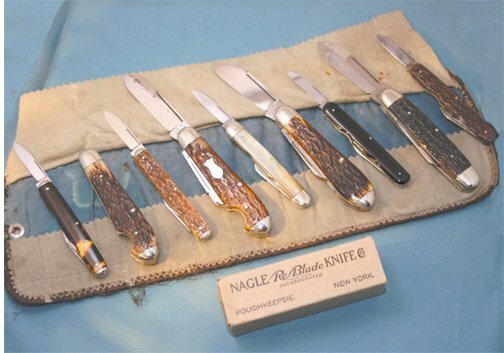 The three men who started the Nagle ReBlade Knife Company were George H. Nagle, president, William A. Yerzley, secretary and chief engineer, and their partner, Carl H. White. White’s early version of the ReBlade knife, handled in both horn and bakelite, is known to have been manufactured at the Piogren plant in Newark. Yerzley is also credited for a later hook-tang design that was manufactured in Poughkeepsie. In 1914, the Nagle ReBlade company relocated to what had been the Anchor Bolt and Nut Company building and the Feigenspan Brewery depot on Parker Avenue in Poughkeepsie. By then only Yerzley’s version of the knife was being made. It was perhaps the attention to detail, costly manufacturing processes and use of high quality materials which ultimately led to the company’s demise. They were forced to file for bankruptcy in 1916 after only two years of operation. How many handles and inserts were manufactured is unknown. If it will make you feel any better, I can tell you that chances are you have not let one of these gems of the knife world slip past your notice. I have been an avid, some may say obsessed, collector of Nagle ReBlades for the past 20 years and I only have but a precious nine knives and sixty extra blades, plus assorted other rare bits in my collection and I feel very lucky to have dug those up. But now that you know what I, er, rather we are looking for, perhaps more Nagles will be unearthed and enjoyed. Michael A. Losicco currently collects New York made knives from his home in Scranton, Pennsylvania. He is an avid collector of all things Nagle and welcomes questions and comments from other fellow Nagle enthusiasts or Nagle novices. He can be reached at galvanic1882@yahoo. com. He is also a life member of the Northeast Cutlery Collectors Association.